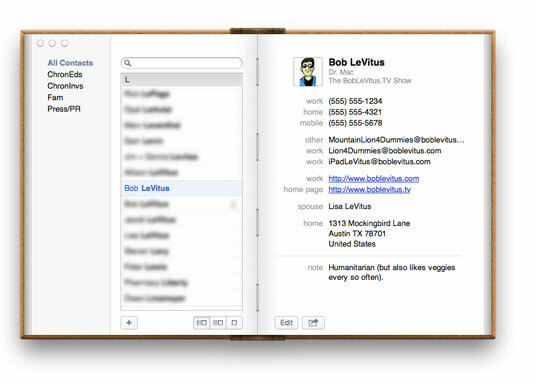 Contacts in OS X Mountain Lion stores and manages information about your family, friends, and anyone else you want to keep in touch with. It works seamlessly with the Mail and Messages applications, enabling you to quickly look up e-mail addresses when you’re ready to send an e-mail, text, or start a chat. 1Launch the Contacts application by double-clicking its icon in the Applications folder, clicking its Dock icon, or clicking its Launchpad icon. The Contacts window appears. 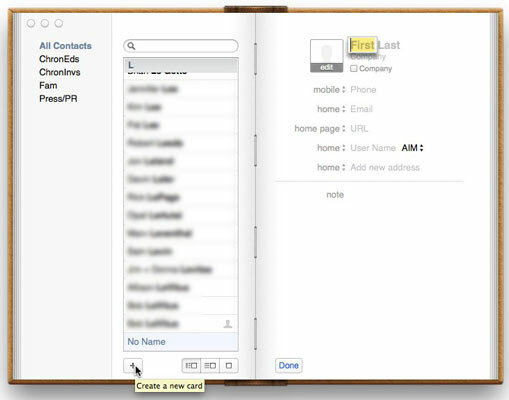 The first time that you open Contacts, you see two cards: Apple Computer and the one with the personal identification information you supplied when you created your account. 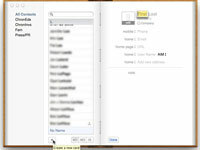 2To create a new entry, click the + button at the bottom of the Contacts window’s Name column. An untitled address card appears. The First name text field is initially selected. 3Type the person’s first name in the First text field. In this example, Bob is used as the first name. Your cursor should now be in the Last text field. 5Type the last name for the person you’re adding to your Contacts. Here, LeVitus is used as the last name. Continue this process, filling in the rest of the fields shown. 6When you’re done entering information, click the Done button to exit the editing mode. The little triangles (actually up and down arrows) between the labels and their contents fields are pop-up menus that offer alternative labels for the field. For example, if you were to click the arrows next to the word Mobile, you could choose Home, Work, Main, Home Fax, Work Fax, Pager, Other, or Custom to replace the label Mobile. To add more info about any Contacts entry, select the name in the Name column. You can tell when a name is selected because it is highlighted. 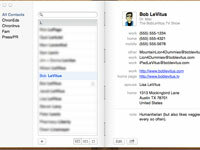 Then click the Edit button at the bottom of the Contacts window and make your changes.